J. Roy's Inc. is a family owned and operated business which specializes in Drilling and Blasting. We are located in Lancaster County and travel over a hundred mile radius covering the eastern Pennsylvania area from our centrally located office in Bowmansville, PA.
J. Roy's Inc. is equipped with twelve track drills and compressors ready to serve our many clients. We have a trained staff of seventeen people with four full-time licensed blasters. 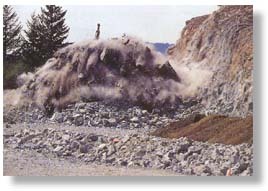 J. Roy's Inc. specializes in the tough blasting jobs where control is the key factor; sewer and water systems, foundations and demolition. More than likely, the closer the property at risk is to the blasting site the more likely it is that J. Roy's Inc. will get the call.